Vicia is a celebration of what goes on above and below the soil. Our ingredients are cultivated with care, setting the tone for an outstanding meal. 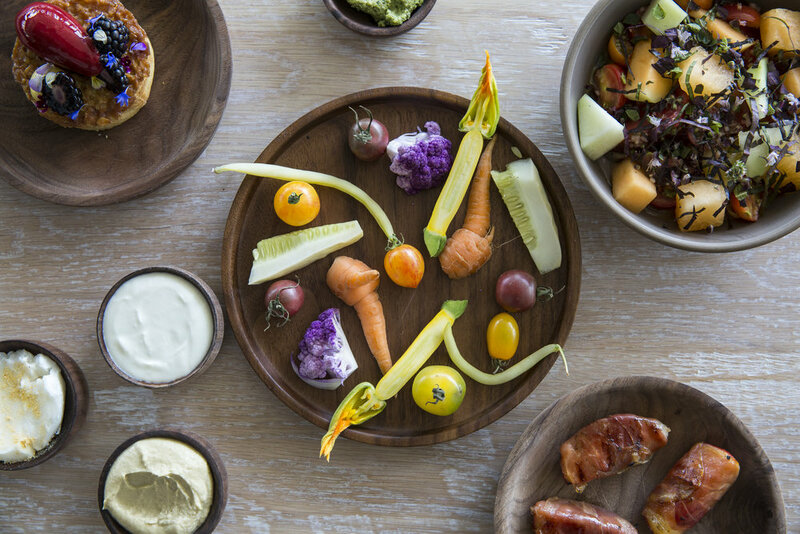 Vicia celebrates vegetable-forward cuisine, which shines a light on beloved and underutilized vegetables, making the most of all their parts and flipping our conceptions of what modern dining and eating tastes like. You’ll discover vegetables prepared with as much love and attention to detail as our proteins. You’ll find them as the star of the show, cooked in animal fats, garnished with protein, or a supporting player to a sustainably raised piece of meat. You may even see them in your dessert. Our menu is driven by the best of what's available at the moment and sourced from relationships we have with farmers, fisherman, and artisans in the Midwest region and beyond. By focusing on what’s fresh, we aim to present a memorable dining experience that can be enjoyed and appreciated in a new way each time. The rare couple that can take their marriage beyond the home to form a seamless working partnership, Michael and Tara Gallina, have found that their complementary professional skills total restaurant gold. Michael’s talent as a chef and skillful ability to oversee the back of house, paired with Tara’s leadership capabilities in the front of house, make for an excellent combination that is fueled by a shared passion for world-class cuisine and service. They opened their highly anticipated first restaurant, Vicia, in March 2017, and have been charming critics and crowds alike ever since. Proud parents to daughter Olivia, and dogs Abby and Louie, the Gallinas are thrilled to have set down roots in Michael’s hometown of St. Louis. Before launching Vicia, they hosted pop-ups in various locations throughout the city for over a year, and discovered a vibrant food community that was receptive to their idea for a seasonal, vegetable-forward restaurant based on the best of what’s available each day. Since opening, Vicia has received numerous national and regional accolades including 4-stars from the St. Louis Post-Dispatch, a semi-finalist nomination from the James Beard Foundation for Best New Restaurant 2018, a Best New Restaurant in America by Eater, Esquire & Bon Appetit, as well as Michael being named a Best New Chef in America 2018 by Food & Wine. Most recently, under Michael’s leadership, Vicia was named the #1 restaurant by St. Louis Post-Dispatch Restaurant Critic Ian Froeb in the STL Top 100 list, and Michael was nominated for Best Chef in America Midwest (2019) by the James Beard Foundation. While working together at Blue Hill Stone Barns, where the couple met, Michael and Tara helped the restaurant achieve accolades from all over the world, including an award for Outstanding Restaurant in America from the James Beard Foundation, and a ranking on the San Pellegrino Top 50 Restaurants in the World list. As Executive Chef at Vicia, Michael Gallina is thrilled to bring a taste of the world he’s explored back home to the people of St. Louis. Sourcing fresh ingredients every day, Michael works alongside his team of sous chefs and cooks, and creates dishes that continually change and evolve with the seasons. His thirst for experimentation with ingredients – fueled by holidays at his grandpa’s house, cooking Yorkshire pudding until the smoke detectors sent the fire fighters to their door – have helped him earn Vicia many accolades since its opening in March 2017, including 4-stars from the St. Louis Post-Dispatch, a semi-finalist nomination from the James Beard Foundation for Best New Restaurant 2018, a Best New Restaurant in America by Eater, Esquire & Bon Appetit, as well being named a Best New Chef in America 2018 by Food & Wine. Most recently, under Michael’s leadership, Vicia was named the #1 restaurant by St. Louis Post-Dispatch Restaurant Critic Ian Froeb in the STL Top 100 list, and Michael was nominated for Best Chef in America Midwest (2019) by the James Beard Foundation. Inspired by his grandfather’s curiosity for cooking and culture, Michael left his childhood home of St. Louis at the age of 22 -- his Cardinals’ cap tucked securely in his suitcase -- to begin his own food-focused journey of the world. After attending the California Culinary Academy in San Francisco, he found a home in Campton Place's four-star kitchen under Chef Daniel Humm, and when Humm moved to New York City to take over Eleven Madison Park, Michael joined his team as sous chef. On days off, he would frequent Dan Barber's acclaimed West Village restaurant Blue Hill, and in 2007 he made the move to join Barber there. After helping run the kitchen at Blue Hill for four years, Michael took on the role of chef de cuisine at Blue Hill Stone Barns in 2011, where he stayed for over 5 years and met his now-wife and business partner, Tara. His culinary achievements at BHSB contributed to many accolades for the restaurant, including Outstanding Restaurant in America from the James Beard Foundation, and a ranking on the San Pellegrino Top 50 Restaurants in the World list. Encouraged by Barber to see the world before taking the reins at BHSB, Gallina spent time in some of the top kitchens in Sweden and Spain, including Faviken and Quique Dacosta. There, he found inspiration in the use of nature and foraging for ingredients, and developed an appreciation for the way that vegetables were treated with the same attention as the choicest proteins. That education only continued during his time at BHSB, and his passion for harvesting food with his cooks, working closely with plant breeders and farmers on developing improved flavor in crops, and creating a cuisine that supports the surrounding farms and landscape, is, for Gallina, forever intertwined with what occurs inside the kitchen. As General Manager at Vicia, Tara Gallina is enthusiastically invested in changing the way we think about food. She’s found that getting to know farmers, breeders, and fishermen has helped her become a captivating storyteller, and as she continues to develop relationships with those in the St. Louis community and greater Midwest region, the stories she hears and shares are growing and shaping the service experience at Vicia. As part of her goal that the restaurant concept and food sparks conversation throughout the community, Tara strives to make Vicia the best hospitality experience in St. Louis, from the informative waiters who speak eloquently about each dish, to the noteworthy beverage program. While overseeing a team of service staff and handling all restaurant operations, she is able to put her detail-oriented, educational-driven leadership skills to good use. Tara has a gift for making people feel welcome, and from a young age has loved bringing her family and friends together around the table. She turned that talent into a career path in 2010, when she left a human resources job in Florida to attend the International Culinary Center (ICC) in New York City. After graduating, she stayed on to coordinate cooking workshops with top chefs for ICC, but felt a fascination with the way in which food was grown rising up within. When a posting for the F. A. R. M. S. apprenticeship program at Blue Hill Stone Barns caught her eye, she jumped on the next train to Tarrytown and never looked back. During the six months Tara months spent working on the farm, she received a sustainable agriculture education and a crash course in fine dining service, which completely changed the way she thought about growing and serving food. While at BHSB, Tara mastered all front-of-house positions, becoming lead bartender and one of the most senior service captains, where each night she created a truly unique and flawless dining experience for each and every guest. Now at Vicia, ensuring that her team is connected to food sources and offering them educational opportunities are just two of the ways in which she is able to integrate the farming community into all aspects of the restaurant. Originally a native of Florida, Vicia Beverage Director, Kara Flaherty, was following a career path in fashion, when she was recruited to work at her favorite bar based on her genuine and outgoing personality. This unexpected opportunity lead to a distinguished career in hospitality. Kara moved to St. Louis in 2012, and worked at restaurants including Five Bistro, Sidney Street and Elaia. She also spent time on the retail side of wine, where she managed the wine offerings at beloved St. Louis specialty shop Parkers Table. Her passion for wine led her to pursue her sommelier certification from the Court of Master Sommeliers. She now brings her talent to Vicia as Beverage Director, with a drive to continue the high standard of hospitality St. Louisans have come to expect from the critically acclaimed restaurant, as well as exciting Vicia diners and staff alike about the restaurant’s noteworthy beverage offerings from non-aloholic options to the most luxurious bottle of wine, all while mixing in her own philosophies and knowledge. Alec Schingel was proudly born and raised in the Midwest, in Urbana, IL. After graduating from SIU Carbondale in 2005, he fell hard down the rabbit hole of kitchens and cooking. He moved to St. Louis and attended L’Ecole Culinaire and spent three years in various restaurants at the Chase Park Plaza. He then spent two years training under chef Gerard Craft at Niche. In 2013, he decided to travel and learn in new kitchens, spending time in Charleston, SC, In de Wulf in Belgium, and finally at Blue HIll at Stone Barns where he met and worked with Michael and Tara. Alec is excited to be reunited with the dynamic St. Louis community and to continue working with the Gallina’s, where he is continuing to grow his passion for bread baking and great wine. Jane Sacro is petite in stature, but as a sous chef at Vicia, one of her most beloved job responsibilities is butchering a whole hog, that is twice the size of her. Jane grew up in Manila, Philippines where her mom worked as a cook for most of her childhood. Jane has fond memories of her mother waking up early every morning to shop for fresh produce at the local market. After moving to the states, Jane chose to follow in her mom’s footsteps and attended Saint Louis Community College, Forest park, graduating with a degree in Culinary Arts in 2015. Jane worked at Robust Wine Bar, while earning her degree, and then took a position as a line cook at Reeds American Table. Jane was an early employee at Vicia and worked her way up to Sous Chef, a role that she takes seriously as the bridge from Chef Michael Gallina to all of the cooks. Jane appreciates and thrives on the passion and creativity brought to the kitchen at Vicia daily, and continues to focus on utilizing local farmers and purveyors, in order to inspire and educate the restaurants’ guests--- and to feel closer to her mom who lives in back home in the Philippines.